A couple of weekends ago, I found myself in unfamiliar territory. 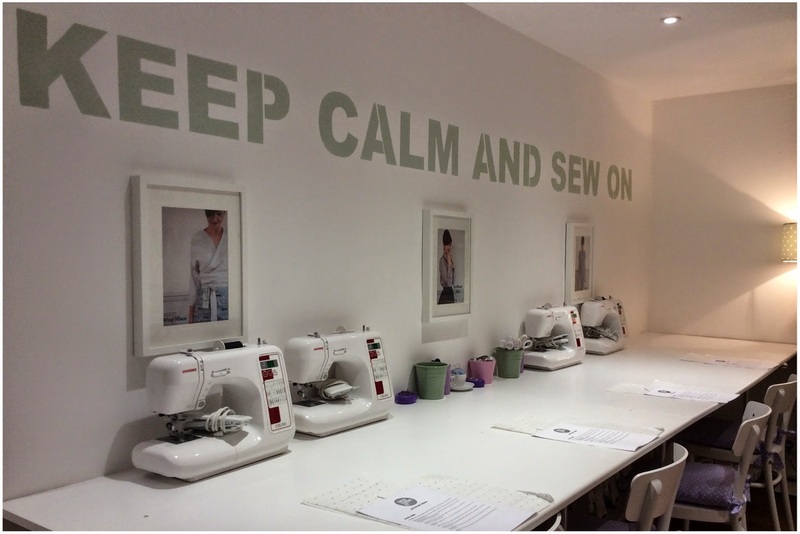 There I was stood in the land of structured creativity over at the Angel branch of Sew Over It about to learn how to SEW. On a Friday evening no less - super rock and roll! 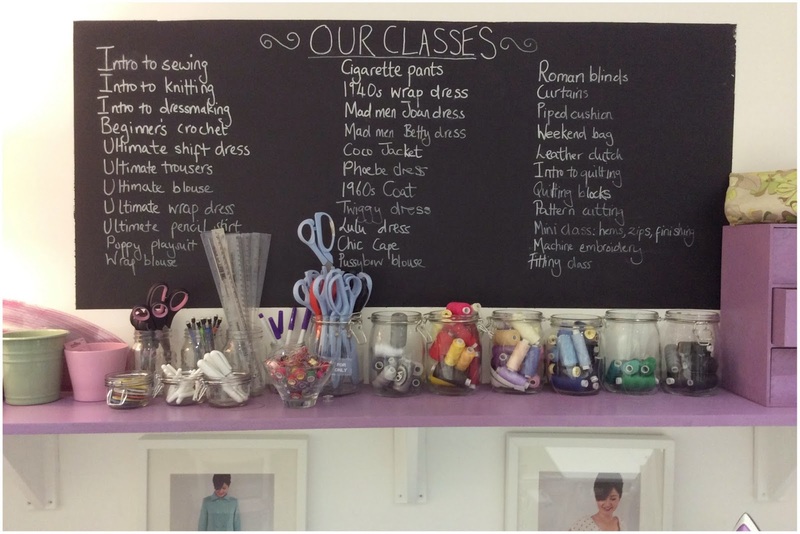 I saw the class on Time Out on offer and thought it would be the perfect Christmas gift for the budding-creative-sewing-star that is miss +Diane. I'm going to be honest, I have used a sewing machine before [in school] but I don't really remember much of school [which my buds love about me] so I decided that I was going to go into this as a completely naive beginner. No knowledge. Pure blank page. 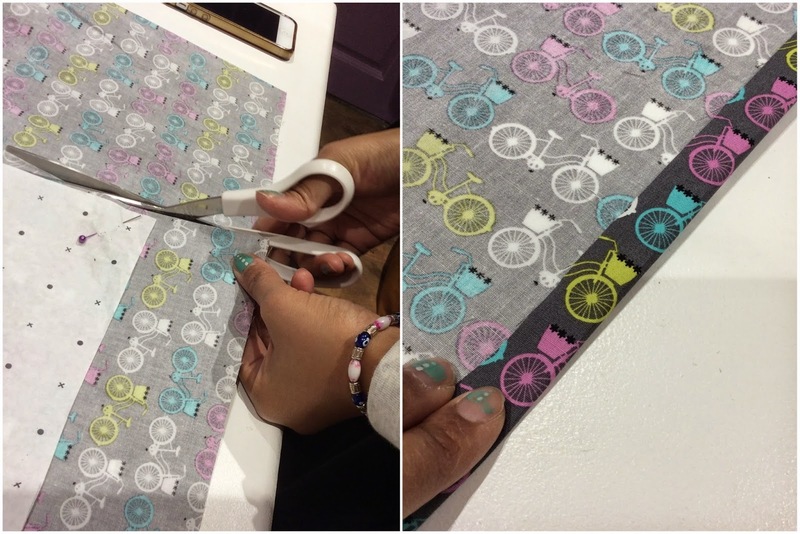 If you've never heard of Sew Over It, get to know. 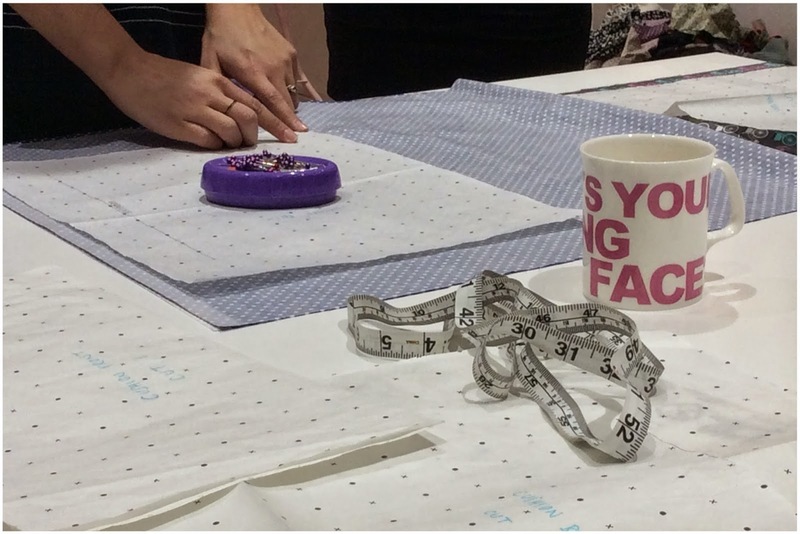 It's a lovely little company that aims to teach and inspire those who want to learn how to sew. 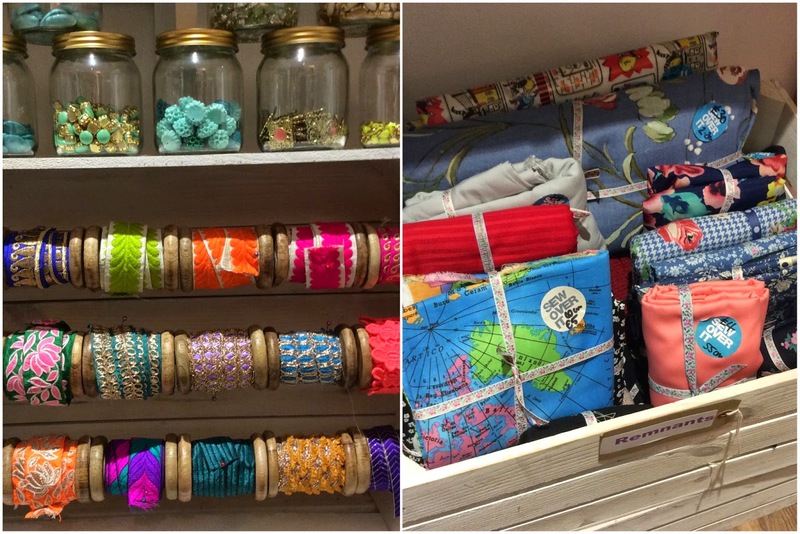 Angel is their newly opened second branch and so has a very new exciting vibe to it. It's not a massive space but it's been finished to a high standard and feels very open and airy. There are a lot of natural photo opportunities [as you can probably tell from my pics] - from nicknacks like colourful threads and ribbons to a rainbow of cloths - everything caught my eye. 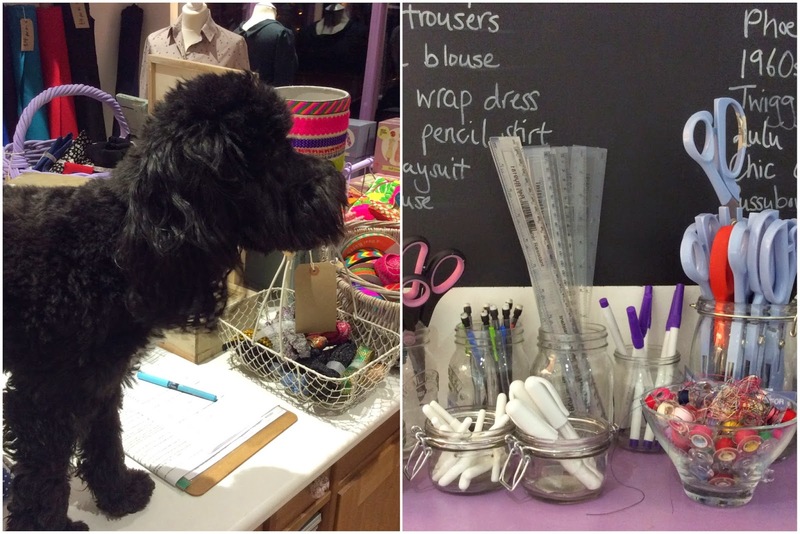 We were greeted by Lisa [owner and visionary of Sew Over It] and her adorable puppy Poppy. The atmosphere was friendly and homely from the get-go and I was instantly drawn in. As part of the three-hour course, we were offered slices of homemade cake and tea [who needs cocktails on a Friday night]. Poppy was super cute though and totally won me over - was sad she had to leave but she was tired after a long day at the shop. Probably a good thing too as I would have constantly been distracted! Whatever my previous view of sewing was [just cut some pretty cloth up and sew it together right?! ], it was ridiculous and completely blown out of the water. I went into the class thinking the preparation:sewing ratio was 20:80 and was immediately proved WRONG, more like the other way around. We spent a lot of time learning how to prepare: ironing our chosen fabrics [to soften], pining the correct side [and the right way around - following the grain] of the cloth, and how to cut properly [with the weight of the scissors and always standing up as it helps the accuracy]. Who knew cutting straight would be this hard. Seriously. I have never really appreciated this part of making clothes but it is crazy precise and needs a very methodical, patient mind because essentially if you mess this bit up the whole thing is over from the start. NO PRESSURE THEN. 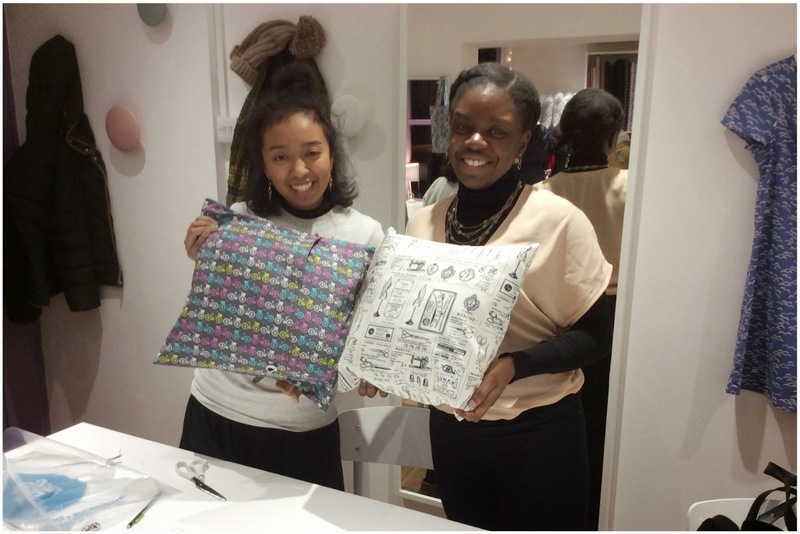 The item we were learning to make was a "Button Me Up Cushion" which involved a relatively simple pattern. Diane and I unintentionally picked one-way patterned cloths which meant we had to be even more careful about where to cut, how, which side and way around - why not add another challenge into the mix, we're adventurous like that. Although this probably sounds [and looks] really easy, I definitely made a few mistakes so was thankful we had a very patient teacher! We also learnt how to use and thread the machine properly - starting off with how to wind a bobbin, then how to thread and get the machine ready to work. This bit I could actually do and was quite fun. The advice was to use the 'tortoise' speed on the machine, but it was too tempting not to try the 'hare' once I got into it [naughty]. 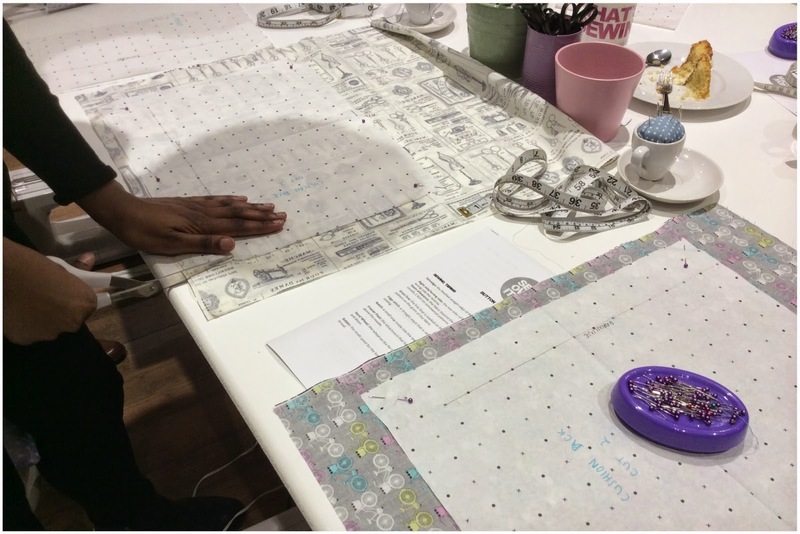 After we finished our cushion cover, we had to iron it again and then pull the corners out properly using a pin. We then had some time to create cute buttons to add onto our cushions - this bit was optional but I really wanted to add moustache men onto my bikes so that it could look like they were riding along, all happy chappies. Outside of what you get as part of the course, the shop is full of so many colourful bits and bobs - I think great gifts for friends who either want to get into sewing or are already pros. There is a good selection of cloths, buttons, ribbons and also pre-made kits with everything you need in them if you're indecisive or just need a little help and inspiration. 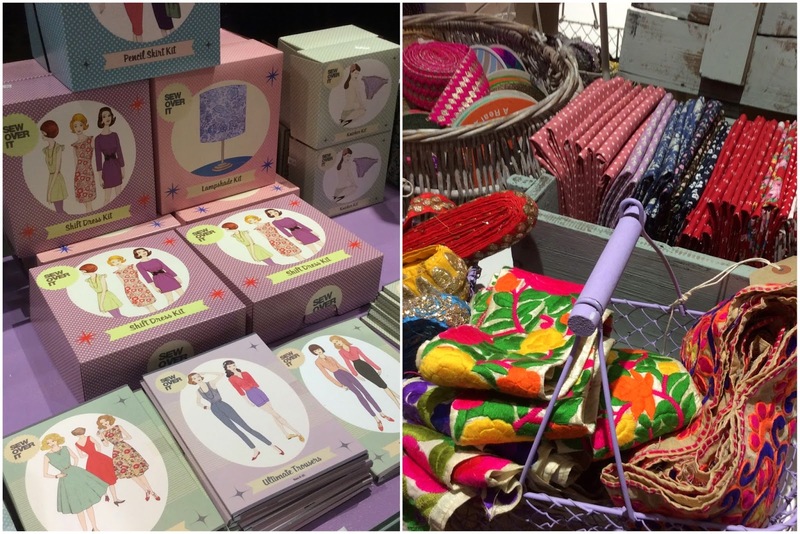 Everything is very cute so could potentially be dangerous for the purse strings… You've been warned. 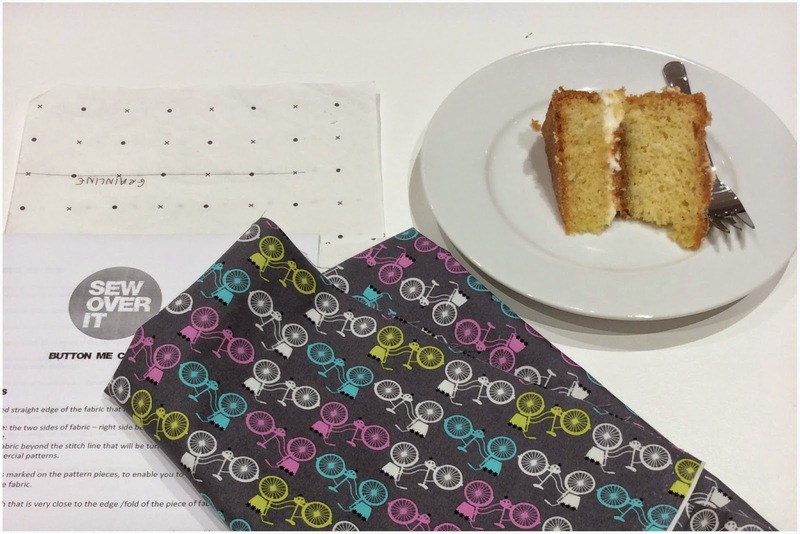 Overall, this beginners sewing class as a starting point was really effective - good pace, patient teacher and relaxed atmosphere [for Diane and I anyway]. 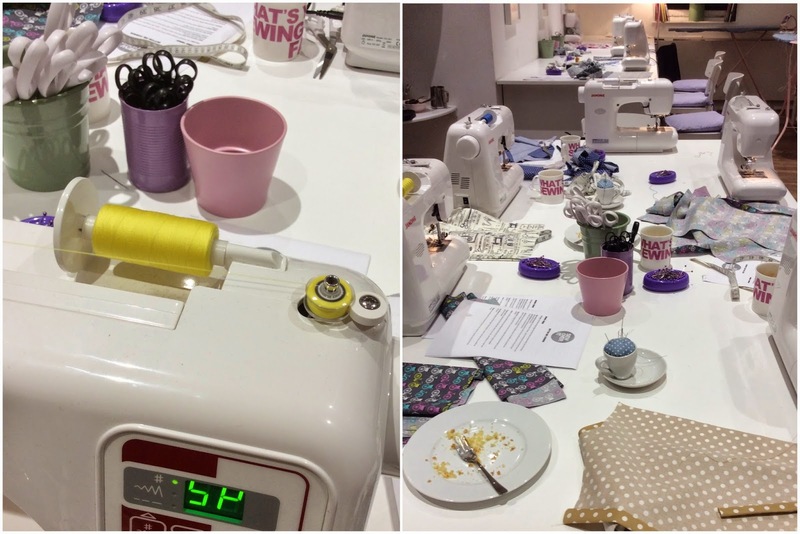 My favourite bit - although we went there specifically for a class, the shop also operates as a coffee / tea shop during the day where you can drop in and either rent their machines during your stay or bring your own machine to create and learn amongst fellow sewing bees. You get to practice with likeminded proactive people and the pros are on hand if you need any help. It's a great concept. For any beginner [or pro needing a refresh] who wants to dabble before investing, this is the perfect place to try out. 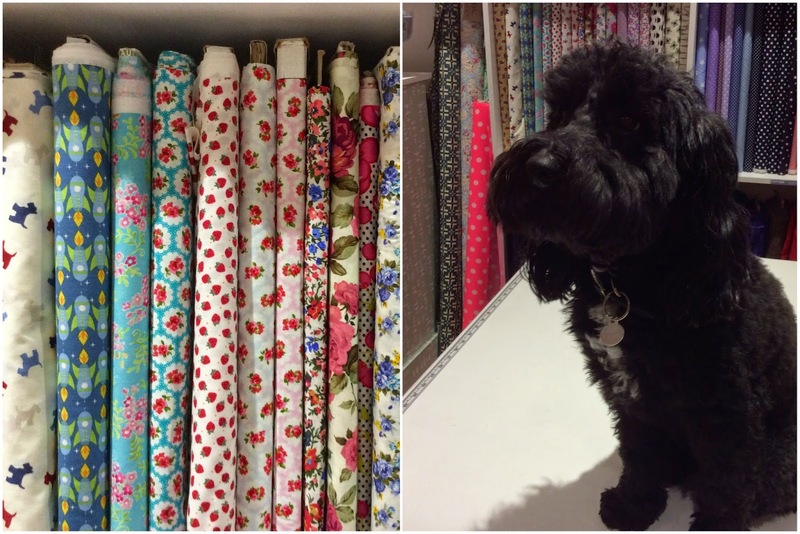 Diane's already planning her next sewing adventure so I'm really happy to have discovered this little gem.